Electronic System is one of the most reckoned industrial heaters manufacturers and suppliers in Bangalore, India. Our products are manufactured under stringent quality checks and therefore known for long life with consistent performance. We have decades of experience in industrial heaters field and supplied our products to major industries in Mumbai, Chennai, Hyderabad, Ahmedabad, New Delhi, Kolkata and other parts of India. Imported industrial heaters are also available with us. Apart from infrared heaters, you can get Mica Band heaters, Cartridge heaters, ceramic heaters, coil heaters also from us. Heaters are one of the most important equipments in industries, laboratories and also used in domestic purposes. Heaters are used for heating solids, liquids and gases as well. 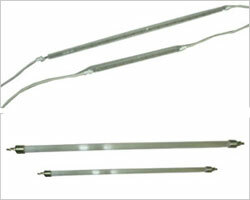 These are heating elements to generate heat in chemical, mechanical, thermal and electronic applications. Heaters are of important types depending on the specific use and the desired temperature levels. Heaters can generate temperature range from 100 degree C to few thousands of degree Centigrade. Heater use electrical energy as the source of input and generates enormous heat as output. Infrared heaters supplied by us are known for high efficiency and performance. They are manufactured by high quality heating coils. The heating wires used withstand high resistance and are safe from any damage due to overheating. Our customers can avail any customized wattage ceramic infrared heaters from us. We executives address any post sales issue immediately. Electron Systems is one of the most well-known manufacturers and suppliers of infrared heaters in India. These days, many industries like automobile, plastic and paper industries are using infrared heaters in varieties of applications. Infrared heaters can help to transfer heat from high body temperature to lower body temperature. An Infrared heater can produce maximum heat energy within the small period of time; using electromagnetic radiation. Electron Systems has manufactured and supplied different kinds of infrared heaters like ceramic infrared heaters, ceramic flat infrared heaters and color changing infrared heaters. Ceramic heaters are also considered as one of the most efficient heaters in today's industries. Electron System is a major manufacturer, suppliers and importers of infrared heaters of medium and short wave types. Most of these products are manufactured in our in-house facility, while few are imported from other countries. They are available in predefined sizes and wattage requirements. However, depending on the customer's specific needs, we also try to supply in customized sizes and wattages if it is in our scope. The external structure of ceramic infrared heaters is an unique feature. They are used in special applications where other heaters are not suitable. 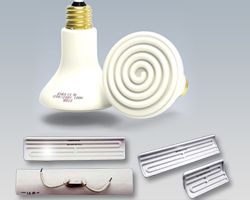 They are available in flat, bulb and coil shape, which makes them useful for different complicated requirements. Electron system is the supplier of these heaters in different sizes and specifications. These heaters are available in power ratings of 250w, 400w, 600w, 800w & 1000w and come with and without thermocouple.